Most people associate wallpaper stripping with “Scrapers” and “Steamers”. However it is actually cleaner and easier to use a “Liquid Wallpaper Stripper”. These relatively new products actually penetrate the wallpaper and dissolve the underlying adhesive to actively release the wallpaper from the wall. Unlike steam strippers they do not damage plaster. FUZE Products have recently released a new addition to their well know Biostrip range of products. Biostrip Liquid Wallpaper Stripper – A cutting edge product that makes quick work of wallpaper removal. Can be applied easily by spray, brush or roller. Cleans paste residue from the walls. However with so many different types of wall covering in use today, instructions for using this type of product can vary. Below is a brief guide to Wallpaper Removal using a liquid stripper. To begin with it is essential that you have some idea of the type of coating you are attempting to remove. For example is it textured, painted, vinyl etc. 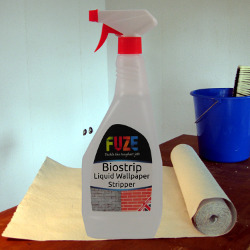 Using Biostrip Liquid Wallpaper Stripper is straightforward – apply by spray, brush or roller. Leave it in situ for up to 10 minutes and then scrape. Traditional wallpaper is generally uncoated and porous – it will easily absorb the Biostrip Liquid Wallpaper Stripper. Simply apply by spray, brush or roller, leave it in situ for up to 10 minutes and then remove with a scraper. Often found in bathrooms and kitchens, these coatings are usually treated with a waterproof top layer. Score the surface lightly from top to bottom, just breaking the surface of the paper. Apply Biostrip Liquid Wallpaper Stripper by spray, brush or roller, leave it in situ for up to 10 minutes and then remove with a scraper. Painted wallpaper may be more resistant to liquid than uncoated paper. Treat as for Coated Wallpapers.